I have partnered with Bloggin Mamas and Tessemae’s All Natural to bring you this Honey Balsamic Chicken Recipe. All opinions are my own and may differ from yours. I am always on the lookout for new recipe ideas. 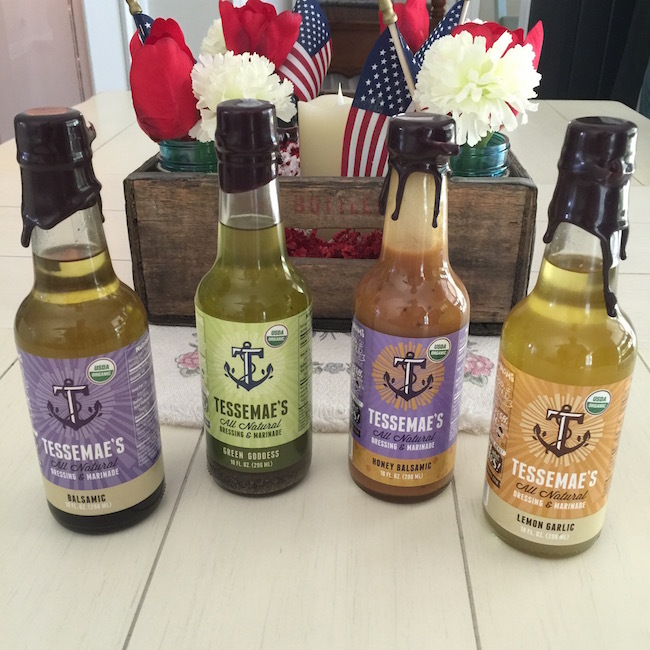 I received the Tessemae’s All Natural Organic Salad Dressings to give them a try and see what I thought. 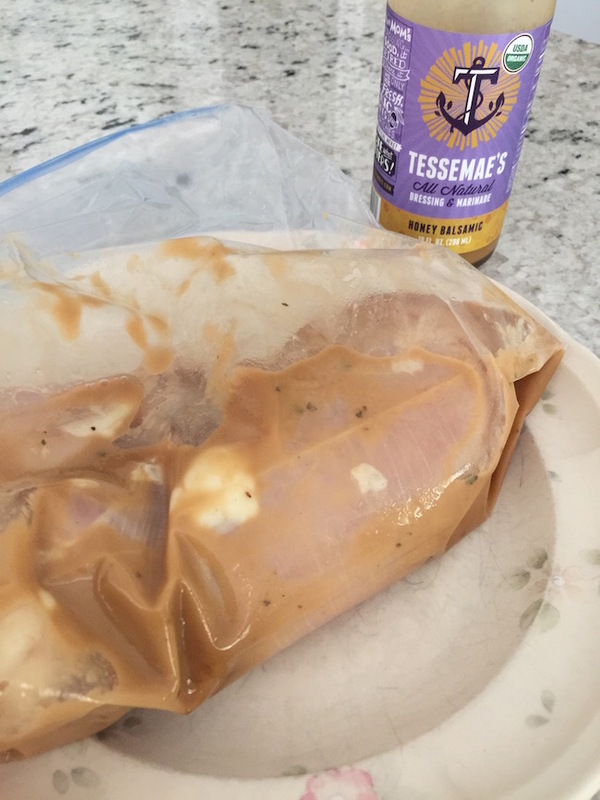 Most salad dressings are just for salads but Tessemae’s can be also be used as a marinade. 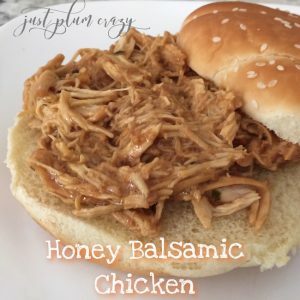 That’s when I decided to make a slow cooker Honey Balsamic Chicken recipe. 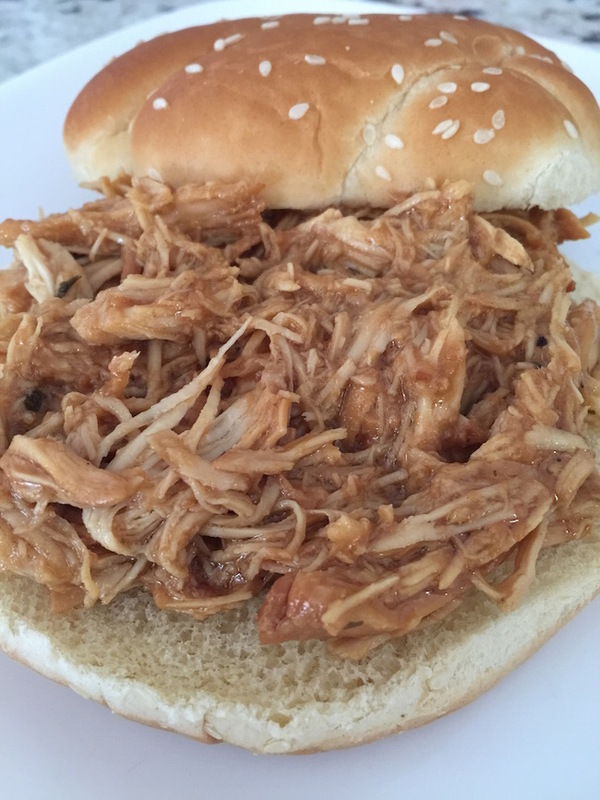 I use my slow cooker whenever possible especially during the hot summer months. It’s been in the 90’s all week so I think it’s safe to say that summer is here! I wasn’t sure how we were going to eat it but I would figure something out by the time it was done. I marinaded my chicken overnight. I used a half of the bottle because I only had 2 large chicken breasts. In the morning I threw it in the slow cooker, poured a little extra Honey Balsamic dressing in the pot and placed it on high. After a couple of hours, the house started to smell wonderful. I cooked it for about 4 hours. I checked the temperature and it was done so I shredded it and put the rest of the bottle of dressing in with it. (I probably didn’t need to use that much, but it tasted awesome!) I stirred it up and let it cook on high for another half hour. Then it was done. I picked up some rolls earlier in the day figuring we could have sandwiches. I piled a bunch on and dug in. You could taste the Honey Balsamic dressing but it wasn’t overpowering. The chicken absorbed the flavor from being in the marinade overnight. I have also tried the Lemon Garlic on a salad and it was one of the best salads I had in awhile. I’m not a fan of boring salads. I’m going to use the rest to marinade some chicken and slice it up for my salad next time. 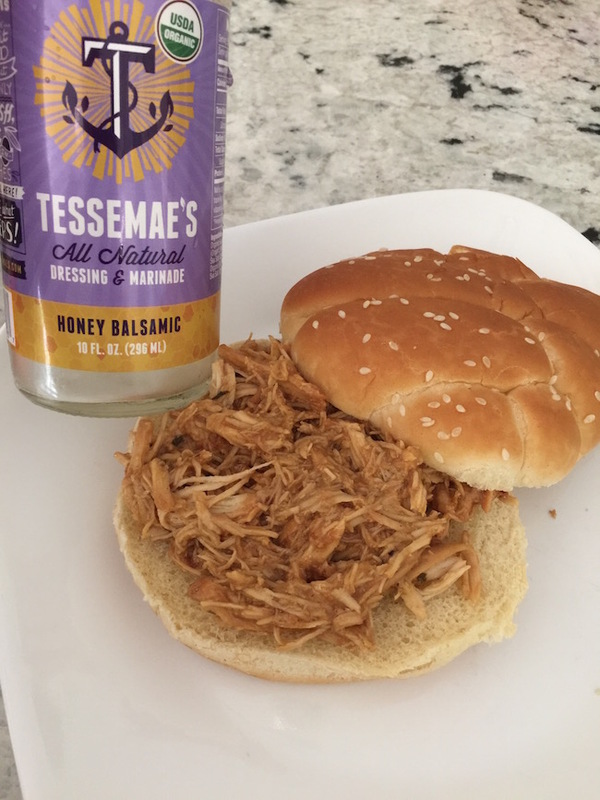 Since I have started following a low carb, low sugar diet, Tessemae’s All Natural fits right in with 0 carbs and 0 sugar. 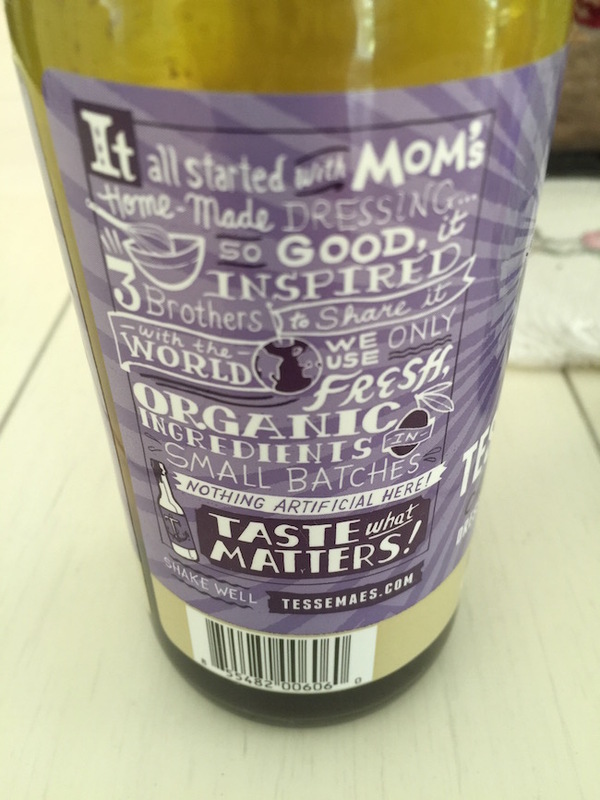 I like that Tessemae’s salad dressings are made with all natural ingredients. None of that funky stuff that you find in some other products. 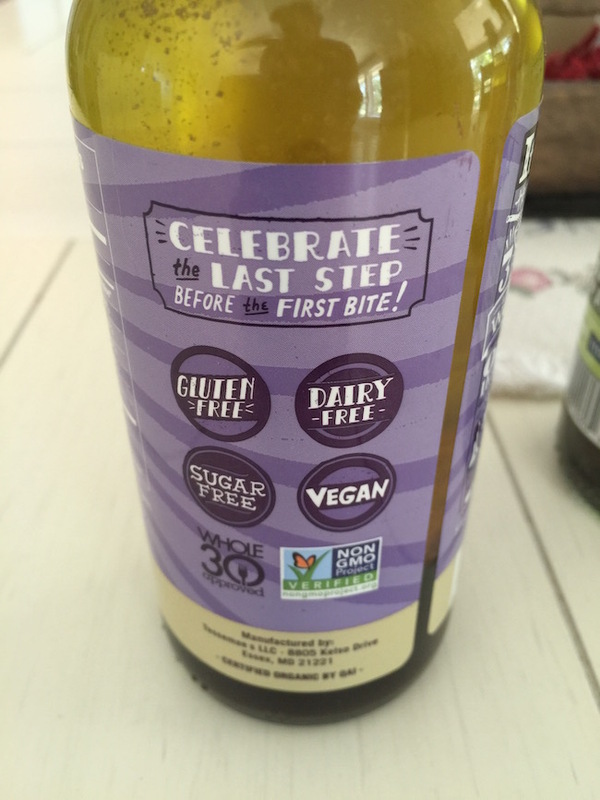 They make 25 different marinades and dressings that are USDA organic, gluten free, non-gmo, vegan and Whole30 approved – and con­tain no added sugar or xan­tham gum… ever! Made by the Vetter brothers, they launched in 2009 at their local Whole Foods Mar­ket in Annapo­lis, Mary­land. It was a recipe that their mom created and used throughout their childhood. There’s nothing better than an old family recipe. Tessemae’s com­mit­ment to healthy eat­ing and liv­ing is the core of their mis­sion, to pro­vide sim­ple, yet deli­cious food to con­sumers made with real ingre­di­ents. Tessemae’s All Natural is available at Whole Foods across the US and Mariono’s and Jewel here in the Midwest. It’s also available online. Connect with Tessemae’s All Natural on Facebook, Twitter and Instagram. 1 lb. bonesless skinless chicken breasts. 1 bottle of Tessemae's All Natural Honey Balsamic Marinade and Dressing. Marinade chicken breast in half bottle of Honey Balsamic marinade overnight. Place in slow cooker and add 1/4 bottle of marinade if it needs more on high for 4 hours. 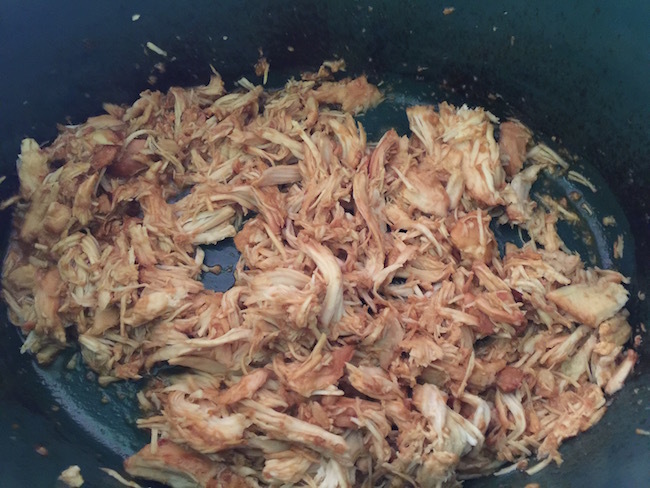 Shred chicken and add the rest of the bottle. Cook on high for half hour so flavors can marry. Place on rolls and enjoy.